Focuses on workplace oriented education. Employees develop literacy and numeracy skills appropriate to their work. Triple E Training delivers state of the art AET instruction to businesses throughout South Africa using a comprehensive curriculum. We dedicate our best efforts to educating, enriching, and empowering unskilled employees so that they may advance in the workplace and society. Training is conducted at our client’s facilities or at sites convenient to workers. We develop our own content! Triple E Training has developed instructional units and assessments that guarantee instruction which is satisfactory to the company’s and worker’s needs. Appraisal of the learner’s proficiency assures that they can apply their literacy and numeracy skills in ‘real world’ situations. 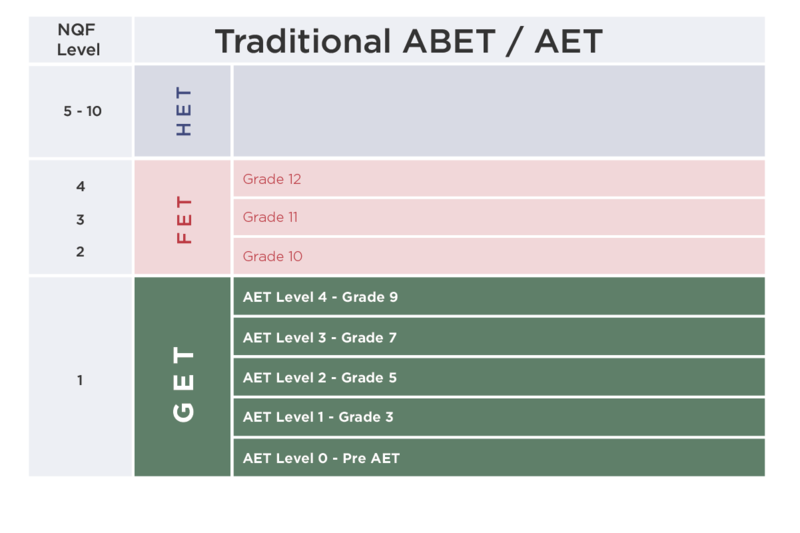 The four levels of AET training are equivalent to Pre AET Level 1 Basic; Grade 9 is equivalent to NQF 1. AET has grown in popularity over the last few years based on the fact that it assists companies with their B-BBEE scorecards. Triple E Training is accredited to change lives through AET and learnerships in various sectors, including mining, manufacturing and agriculture. 1 Awareness After reaching agreement on a training programme, Triple E Training suggests a informal interactive session with employees, providing them with the programme’s information, and highlighting the benefits of AET. This is also used to desensitize the assessment process which often serves as a barrier to training. 2 Placement Assessment A vital part of selecting the relevant training for your employees is the Diagnostic Assessment. It is an interactive session for a group of candidates and will place the employees in the correct AET level. We assess individuals in order to determine their knowledge (not qualifications) with regard to reading, writing and mathematical abilities. 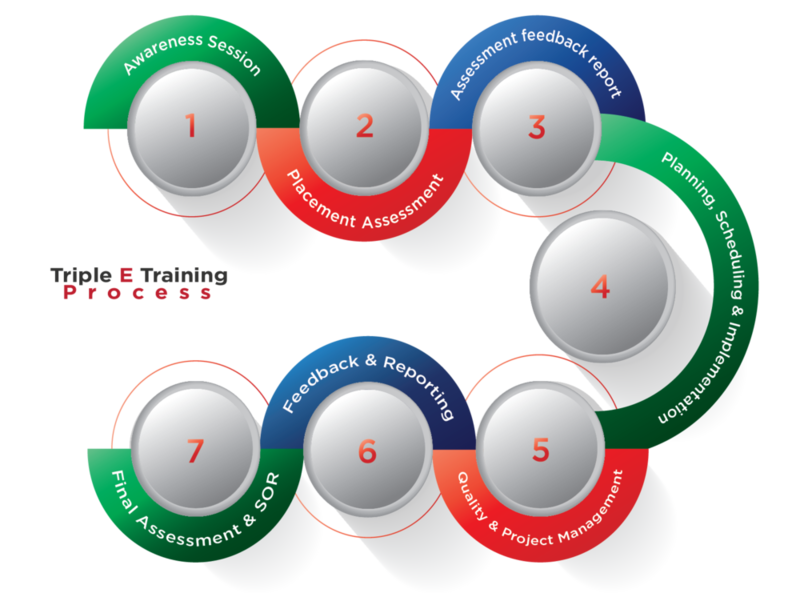 3 Assessment Feedback A summarised report with your employee placement will be supplied for each employee. The training options and the eligibility of the employees for enrollment to the programme will be discussed. 4 Planning, Scheduling & Implementation The client will specify the days and times available for the programme and thereafter a suitable facilitator is sourced and placed. Learning material and necessary documentation will be delivered to the training site. 5 Quality & Project Management Dedicated Quality Assurance and Project Managers are assigned to ensure your training is delivered and the quality is managed throughout your program. 6 Feedback & Reporting Constant feedback and updates about your project and employee progression will be communicated. A Key Account Manager is assigned to your project to oversee all aspects and visit you from time to time. 7 Final Assessment & SOR All final assessment options are fully administrated by Triple E Training. A Statement of Results are issued accordingly. All portfolio assessments (i.e. work completed by the learners) are assessed and moderated by constituent assessors and moderators. Consists of Communication in English & Mathematical Literacy. On the job writing & processing skills, problem solving & cognitive thinking. Starts at NQF Level 2 & carries 40 credits. Streamlined company operations & systems. 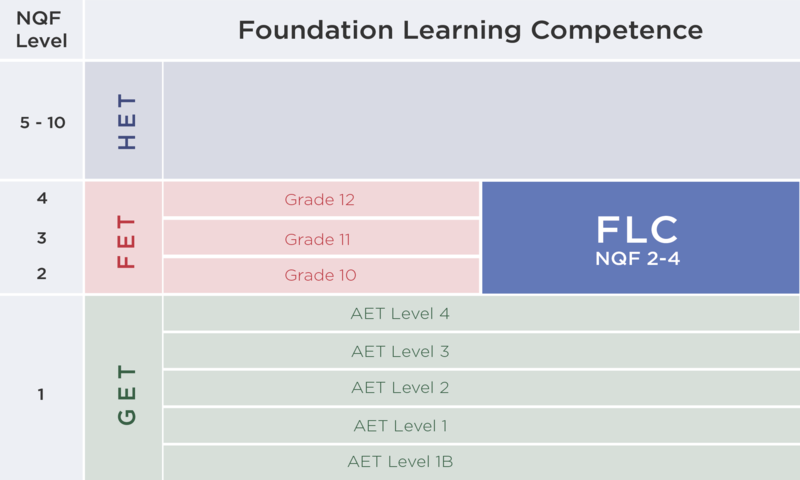 Foundational Learning refers to the competence needed in the low key areas of Communication and Mathematical Literacy in order to deal successfully with any training at NQF Levels 2-4. It is a part qualification registered at NQF Level 2, SAQA 88895, and carries 40 credits in total. Each learning area carries 20 credits. The focus in Foundational Communication is on developing reading, writing, speaking and listening skills that will enable the employee to function optimally in the workplace, to enable the employee to deal with further training, and to access materials and related assessments. The focus in Foundational Mathematical Literacy is on using, and responding to, mathematical ideas and applications in all content and the application of knowledge at different levels of complexity. FLC is aimed at employees registered on the NQF at level 2, 3 and 4. It is a compulsory component for all new qualifications developed by the Quality Council for Trades and Occupations (QCTO) at NQF levels 3 and 4. On Site Training material, assessment guides and fully equipped passionate facilitators are provided to you. Personal Training is face-to-face, on your premises for the most effective, individualised training experience. Accessible Programmes are scheduled to suit the client’s shift/production requirements. Equipment needs are minimal i.e. desk, chair and whiteboard. Familiarises employees with the English writing skills that they will be expected to cope with in the workplace and in training material. The employee should be competent in AET Level 4 English and Mathematical Literacy before they can commence with FLC. FLC is specifically designed for AET 4 (NQF 1) employees and also for current employees who wish to improve their basic skills. Triple E Training’s products are aligned to the National Qualifications Framework (NQF). The NQF is a framework on which standards and qualifications, agreed to by education and training stakeholders throughout the country, are registered. The NQF is a means for transforming education and training in South Africa. 1 Awareness After reaching agreement on a training programme, Triple E Training suggests a informal interactive session with employees, providing them with the programme’s information, and highlighting the benefits of FLC. This is also used to desensitize the assessment process which often serves as a barrier to training. 2 Placement Assessment Entry requirement is the IEB Readiness Assessment. It is an interactive session for a group of candidates and will confirm employee readiness. The IEB assesses individuals in order to determine their knowledge (not qualifications) with regard to Communication and Mathematical skills and whether the employee meets the entry requirements. 4 Planning, Scheduling & Implementation The client will specify the days and times available for the programme and thereafter a suitable facilitator is sourced and placed. Employee material and necessary documentation will be delivered to the training site. 6 Feedback & Reporting Constant feedback and updates about your project and employee progression will be communicated to you. A Key Account Manager is assigned to your project to oversee all aspects and visit you from time to time. 7 Exams & SOR Assessments are done through IEB exams. A Pen and paper exam is conducted on site. The employee will be issued with a statement of result once employee has been found competent by the IEB. Examinations are scheduled in accordance with the IEB Annual Exam Calendar. Workplace-based training programme on your premises. 30% theory & 70% practical. Invest in Learnership Programmes, receive Skills Levy Returns. According to the South African Qualifications Authority (SAQA) a learnership is a work based training programme that leads to an NQF registered qualification. 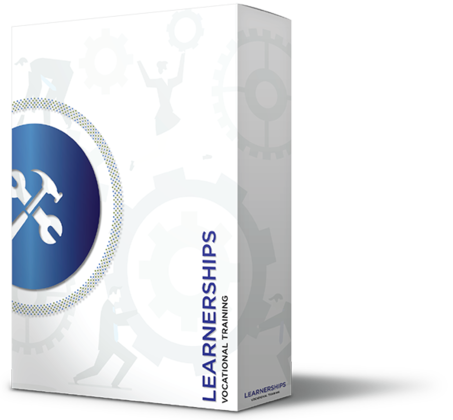 Learnerships are directly related to an occupation or field of work. The Employee is required to complete a theoretical programme and practical training at the workplace in order to graduate. Unemployed adults can also take part in a learnership if the company is willing to take them on; this is called a sponsored learnership. The theoretical part of the training is provided by an accredited training service provider, while the practical learning takes place at the workplace under the guidance of a mentor. Learnerships last for the duration of the time to complete the qualification. During the learnership, employees will be required to complete assignments, tasks and practical tests and projects. They will be formally assessed. If all these assignments are completed successfully, the employee will be awarded an NQF-registered qualification that is recognised nationally. Through learnerships, government promotes access to education and training because the learnership allows the employee to get started on a career while studying for an educational qualification. By embarking on a learnership programme your company therefore contributes to the economic empowerment of individuals, and the economic development of the country. 1 Awareness After reaching agreement on a training programme, Triple E Training suggests a informal interactive session with employees, providing them with the programme’s information, and highlighting the benefits of the Learnership. Enrollment and commitment letters to be signed for easy planning and scheduling of the Learnership. This is also used to desensitize the assessment process which often serves as a barrier to training. 2 Placement Assessment A vital part of selecting the relevant training for your employees is the Genesis Placement Assessment. It is an interactive session for a group of candidates and will place the employees at the correct level of learning. We assess individuals in order to determine their skills knowledge and not qualifications with regard to reading, writing and mathematical abilities. 4 Planning, Scheduling & Implementation The client will specify the days and times availble for the programme and thereafter a suitable facilitator is sourced and placed. Employee material and necessary documentation will be delivered to the training site. 6 Feedback & Reporting Constant feedback and updates about your project and employee progression will be communicated. A Key Account Manager is assigned to your project to oversee all aspects and visit you from time to time. Employee registration and progression outcomes will be uploaded on the SETA database as they progress with each module. 7 Final Assessment & Certification Learnerships are assessed via Portfolio of Evidence and a learner log book. Each module and logbook is assessed by an registered assessor and moderators with the relevant SETA. Once Employees have completed the entire qualification a final onsite assessment is arranged with the relevant SETA for the issuing of the Employee Certifications once they are found competent. All our products have NO hidden costs. All our programmes are accredited. All programmes grant opportunity for further education & training.